I’ve stumbled across a real gem the other day. 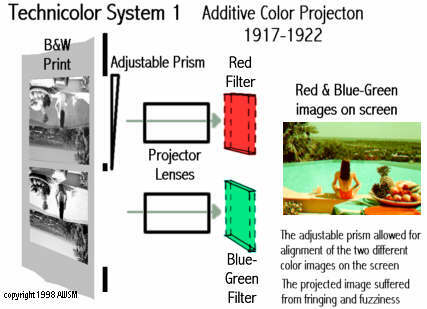 In researching 2 and 3 strip film processing techniques, color spaces, and projection systems (yes nerdy I know…), I came across a link to the Widescreen Museum Old Color page, which offers an incredibly interesting technical overview of old film color techniques like Technicolor, Cinecolor etc. If you are at all interested in how these films get their unique look, curious about reverse engineering a specific look, or simply enjoy a taste of cinema history, be sure to check it out, as there is an exhaustive amount of information contained in this site. First Max 5 Preview: Music Patching, the Next Generation?